It seems to work well mechanically, however 2 of my 3 cats are afraid of it after they saw/heard it do its taking action. The 3rd cat thinks it's a play house and likes to sit in it and watch the others through the translucent cover. Hopefully they will catch on to its proper use soon, otherwise it's an expensive play house! Skip the chore of scooping with this self-cleaning litter box. The PetSafe scoop-free design features a raking mechanism that automatically cleans the litter after your cat relieves herself, so her box stays fresh even when you get busy. The privacy hood helps your cat feel safe and comfortable while she uses her box, and the small design is ideal for small homes and apartments. 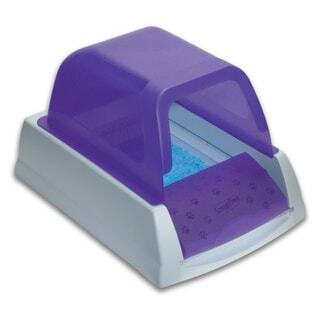 The litter box comes with a disposable tray filled with crystal litter for ready use. I purchased this product (with the Privacy Hood) back in Jul 2012. I also bought the Forever Litter Tray so I wouldn't have to change out litter boxes. My cat was a year old and rescued from an abusive home. I set up the unit and put in the Fresh Step Crystals and walked away. It took her a little time (as in hours...with no accident anywhere) & she gave it a try. Evidently she is happy, as she has never an accident in the house. The only odor comes from her immediate use of the litter box. Once the rake goes through and sweeps into the trap...no more odor. No odor when I clean the trap out every week either. I add about 1 cup of Fresh Step Crystals after I clean the trap. About once every 6 weeks, I empty everything, wash it, dry it, add fresh litter and walk away. My cat is usually sitting right there waiting for me to walk away and the rake to go through so she can use it. I will be a great-grandmother in July and want my granddaughters 2 cats to have an odor free area. I'll also be getting the ScoopFree Anti-Tracking Litter Mat to help with any tracking issue. I hate cleaning the litterbox so this was an amazing (and worth the money) buy for me. It does exactly what it says it does; however, if you have multiple cats--I have 2--you will need to change out the box or at least scoop and use replacement litter to get through 2 weeks. To be fair my cats are old so that may also shorten each box's life. But I don't mind the full reclean every two weeks if I don't have to scoop every day. I also recommend the top--my girls kick up the litter everywhere so the top helps keep more inside. One other thing, you don't get the grit o other litter, but the "tiny stones" can hurt so be prepared to vacuum. This is a nice Larger sized litterbox. It is easy to use and once the cat gets used to it they love it. The crystal litter has no effect and the cat GINGER goes and does her job everytime. Love it and she loves the privacy hood. Expensive trays but overall well worth it. The ease of cleaning the litter box and the fact that there is "no touch" with regards to the litter makes this the best option. My mom has COPD so the dust from regular litter can be a real health issue. In addition, I really like the added benefit of not handling the litter when dirty. Less exposure to cat excrement has to be a healthier option for everyone, not just those with an already weakened immune system. The litter box allows you to keep track of how often the cat uses the litter box, this can alert you to issues with your cat's health but the bigger benefit is to know exactly the best time to change the litter tray out. This helps to avoid the problems that others have reported with overwet litter, the tray works well up to approximately 80 uses. Each household will have its own ideal number of uses so be sure to watch the counter. Petsafe scoop free ultra self cleaning litter box is pretty darn good so far! I really like that it has a count of your cats useage only because I moved from traditional litter to these crystals and w asnt sure how my cat would like it. Very clean, no smell and made my life so easy! It's everything it claims to be. The crystals dehydrate the waste perfectly. The smell, however, is not as diffuse as I'd hoped - but a cup or so of baking soda does the trick (which I've always used with any box). Like that it doesn't track all over the apartment. Best part - ALMOST COMPLETELY SILENT!!! I've used other auto-boxes previously and could hear it behind closed doors. This one runs so smoothly and silently, I didn't even realize it was working! Highly recommend. I had high hopes for this product and bought two boxes. With three cats, I thought this might be healthier for them, reduce odors, and cut down on work for me. It really didn't. I'm an experienced cat owner and transitioned slowly from my other litter boxes to these, but when the old boxes were finally removed, all kinds of behavioral problems began. First, you are lucky if your cat doesn't mind using this machine. What I noticed is they may use it for a while and seem OK, but cats can be weird; the minute they happen to be nearby and the mechanism kicks in, making noise, they can suddenly become suspicious of the box and no longer use it. I've never had any issues with cats doing their business outside of the box until I got this product. Suddenly, bathroom rugs, towels, or anything soft that happened to fall on the ground was fair game to pee on. Disgusting. Quite possibly the worst feature of this machine is that it may clean the waste into a receptacle in the front, but the waste is still sitting there emitting odors until you decide to throw out the disposable tray. And it gets very expensive to change it more frequently than they recommend, which you will have to do if you have more than one cat. Overall, I thought this product was junky and useless, and found myself having to clean it almost as much as the regular litter box to keep the smell under control. Absolutely, categorically not worth it. This is the last litter box you will ever buy . At this point with two cats I cannot imagine having something else . Easy to assemble, wonderful features, no mess ,no smell it's made of magic . Spend the extra money on your kitties. This is the best litter box I have ever owned! It works great. I love the fact that I now only have to clean my cat's little box every 3 weeks! It's easy to clean too. I use the blue crystal petsafe scoopfree litter tray. It's another amazing product because it keeps the smells away! I have always hated cleaning a litter box. Its to ackward and heavy. Not to mention the smell!! This self cleaning litter box is fantastic! It even tells you how many times it has been used!! And easy to change, all in one box. Wish I had this years ago!! Yeah, I'm loving this thing. I have two cats who are pretty average on the size and weight scale. One of them adapted quickly to the new box, the other is still holding out but will occasionally pee in it. It's the number 2s that took them both a while to gather the courage for. But overall, with a lil time, patience and reward treats, this thing definitely pays for itself with the saving of energy and time. Recommended! This is so much better than the traditional cat box. Work great! So glad I purchased this!! Just wish I purchased this a long time ago...and I'm sure my cat wishes I did too! Love love love this liter box. Its saving me so much time and energy. My cat loves it too...I wish the catch cup was a little deeper. Love it! I have two adult cats and a kitten. Works great. My kitten had no issues while my adult cars were dubious but followed her lead. Great buy. This box is a joke. Sold it to someone that either has more patience than me or just doesn't clean it as often as needed. Very cheap for the price. I purchased the PetSaFE Scoop-Free Ultra Self-cleaning litter box because I wanted an automatic cleaning litterbox for my home. I ended up returning this one because I don't want to have to purchase special pads and litter. I liked the design concept of this, other than the requirement of the replacement pads. The size was good and the litter containment was good. Easy to assemble!! ...my cat was a little unsure of it at first, I did have to remove the hood for her to start using it... I wil try to add it after a week or so. This thing really does work. I love the indicator that lets you keep track of how many times it's been used. The price for the PetSafe Scoop-Free Ultra Self-cleaning Litter Box was great but unfortunately too big for my space and the cord wasn't long enough to reach the nearest outlet so I had to return. Otherwise best price around. "Do you have to buy replacement waste boxes"
Yes. I've found that local pet stores sometime carry the items. You can find replacements online for sure though. "Did it come with a crystal litter disposal box?" This item features a disposable tray pre-filled with ScoopFree Crystals. Had this product before when my mother had 2 cats. LOVED IT! Just rescued 2 cats so ordered an other one to replace the one we gave away back in 2002 when we lost those all 3. Mama and her 2 elder cats. I m tired of cleaning up the kitty litter on the floor after the cat does her job. This product has the enclosed feature. I hope it works out. How to Clean a Large Dog Bed from Overstock.com. Properly cleaning large dog beds can keep you and your furry friend happy and healthy.